From the main screen of your database, click on File - Year End - Close Last Year. It's best to run a springclean to make sure there aren't any issues in your database. Also if your financial year is unbalanced, the springclean error report can indicate where the problem is. Once the Springclean report has been viewed, a tick will appear in the “Springclean has been run” box. Click the Next button to continue. 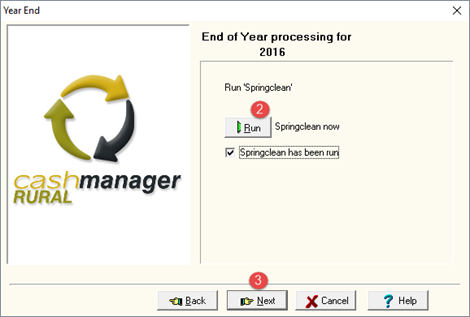 NOTE: If a springclean report appears, you will need to fix any problems and then re-start the Year End process again. Click the View button to show the Accountants Report. You can print this report to keep a copy for filing. Close the Accountants Report and click the Next button to continue. You will be prompted to view the Asset Report. Click the View button, you can print this report to keep a copy for filing. Close the Asset Report and click the Next button to continue. 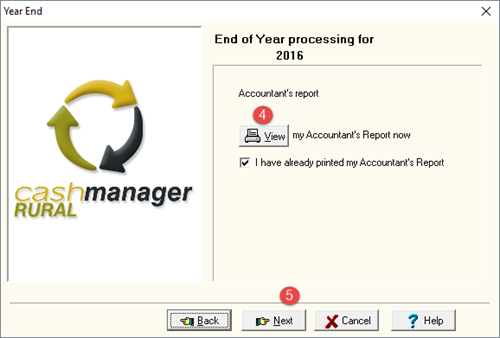 Click Finish to complete closing the financial year. When you next open the Transaction screen, you will see the current year’s transactions. TIP: To see transactions in a closed off year, use the Filter button in the Transaction screen.